Kicking off the film you are taken back to where we left off, with Thaddeus Bradley (Morgan Freeman) vowing to give the Horseman what they deserve as he rots away in a prison cell, having been locked up by the leader of the Horseman, undercover FBI agent, Dylan Rhodes (Mark Ruffalo). You get a glimpse into Rhodes’s past, which ultimately reveals what set him on his path and what the long game really is. Because you see, it’s all about the long con here. As Thaddeus reveals, if you lose sight of the long game, you might as well quit because you’ve lost. While Thaddeus Bradley is in prison, The Horsemen are in hiding. Atlas, Merritt McKinney and Jack Wilder (Jesse Eisenberg, Woody Harrelson, and Dave Franco) have all gone underground awaiting direction from Rhodes and the all-knowing magician’s secret society, The Eye. When they decide to reemerge, things go awry and they end up captured in Macao. Enter bad guy, Walter Mabry (Daniel Ratcliffe), who does such a good job playing a whiny entitled douche bag that he’s easy to hate. The events that unfold as The Horsemen try to make their way out of Macao while getting their groove back as one unit are really enjoyable to watch. There is magic and a lot of card play strewn throughout, but mostly it’s the interactions between the cast that make the film fun. The relationships between characters like Rhodes and Atlas, Thaddeus and Rhodes, and newly developed ones like Lula and Wilder and McKinney and his twin brother seem effortless. It feels like they are a team that’s been working together and you really are just an audience that gets to observe from the sidelines. This may be because the film is just a fun flick or it may be because they were actually having fun while making it but either way, I really enjoyed being on the sidelines for the show. While there are some slow spots and a few scenes that perhaps are a bit over dramatized, remember- it’s about the long game. Don’t get too caught up in the little things and you should leave the theater satisfied. Warner Bros conjures up some magic with the 4K UHD release of ‘Now You See Me 2‘, which has a HEVC H.265 encode in HDR10 with a 2.40:1 aspect ratio. This release has a digital download code as well as the standard Blu-ray version, in addition to the 4K disc. There is no 3D option here. There are certain moments and scenes where the 4K UHD comes through nicely. Other parts, not so much. Detail is sharp and vivid, showcasing every tiny stitch in the wardrobe and stage costumes. Wrinkles in the skin and individual hairs look amazing in closeups as well. The wider shots of the lavish and brightly colored buildings look excellent as well. There is a definite uptick in resolution in the well lit scenes. Colors are more nuanced through the various lighting throughout the film as the costumes truly show off their natural colors in different light. The black levels are deep and inky for the most part and the skin tones are natural in all lighting aspects. There were some instances of some minor judder and aliasing that I noticed during the darker sequences, but other than that, this video presentation in 4K is solid in most instances. 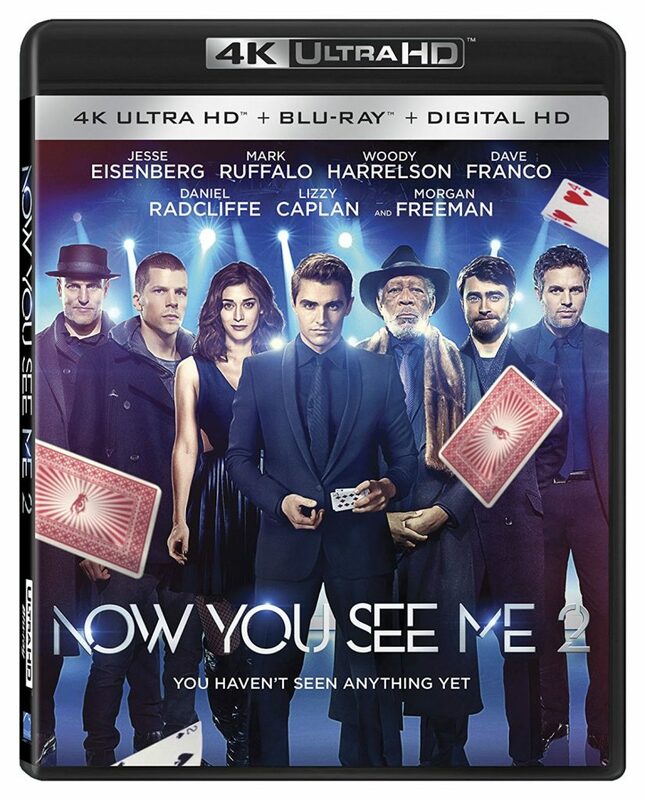 This UHD release of ‘Now You See Me 2‘ has an English: Dolby Atmos track, where I used a 7.1.2 Atmos speaker setup with the normal 7.1 surround and two overhead speakers, plus a subwoofer powering this comedy action soundscape. The standard Blu-ray version has a Dolby Atmos track as well. This is an excellent audio presentation and is demo worthy for this type of film. The fully immersive track is outstanding in the heavier action scenes, particularly ones that involve big crowds watching the magic happen. You’ll feel like you’re in the center of these crowds with people yelling, screaming, cheering, and talking on all sides of you. The overhead ceiling speakers put out ambient noises of people chattering as well, along with nature and city sounds. The clubs in Macau sound impressive here as well. The low end brings the bass nicely throughout as well. The music of the film always adds to the entertainment value and suspense without drowning out any dialogue. Speaking of the dialogue, this is crystal clear and easy to follow, and free of any pops, cracks, hiss, or shrills. This is top notch audio presentation. 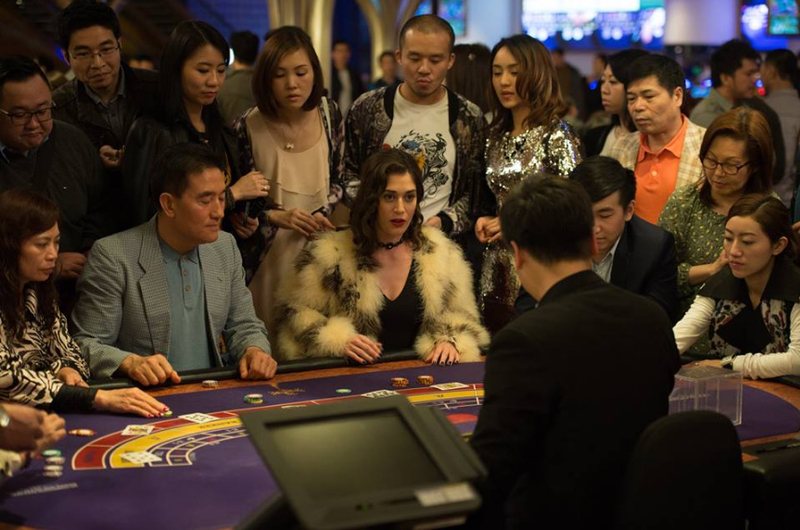 Audio Commentary – Director Jon M Chu offers an insightful commentary that discusses making the sequel, casting the new actors, going to different places, filming on location, and some technical aspects of the film. The Art of the Ensemble (HD, 21 Mins.) – This is an extra long promo reel, where the cast and crew discuss working on the film and with each other, who are all big stars. You Can’t Look Away (HD, 17 Mins.) – All of the visual effects are touched upon here with interviews and behind the scenes looks. Pretty cool stuff here. Bringing Magic To Life (HD, 16 Mins.) – Here we have discussions with the cast and crew, along with David Copperfield about magic and illusions, and how they were used for the film and the impact on our culture and society. 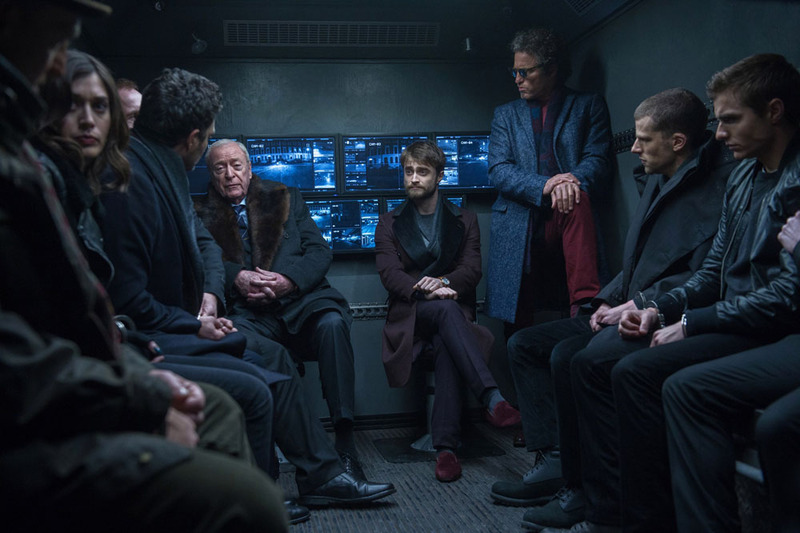 ‘Now You See Me 2‘ might not be the best sequel out there, but it is sure fun and keeps you guessing. The film is fast-paced, entertaining, funny, and thrilling. It isn’t the best, but it gets the job done. The upgrade to 4K is good when it comes into play, but the audio of Dolby Atmos is damn near perfect. The extras are decent as well. Again, this release is Recommended since you get the 4K UHD version, the standard Blu-ray version, and the digital copy. 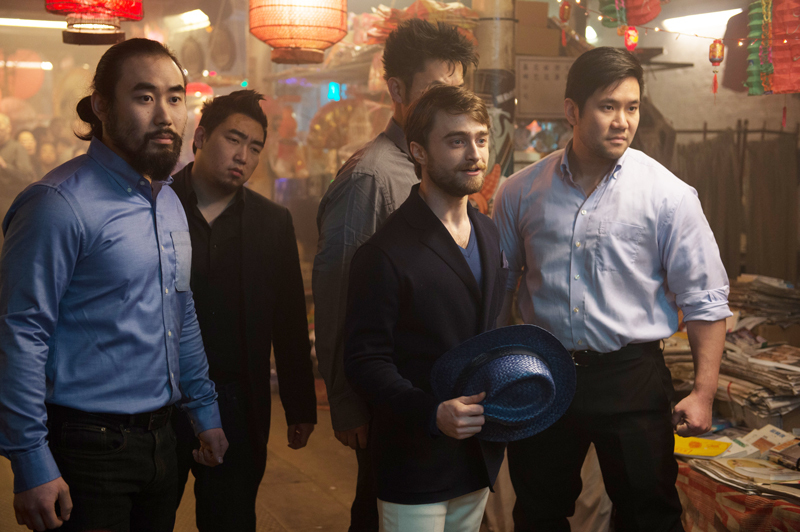 Radcliffe and Caplan Cast In ‘Now You See Me 2’!!! 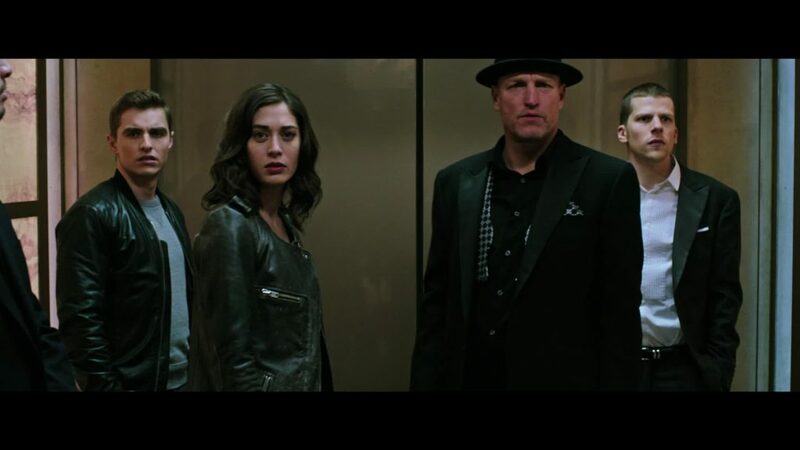 Enjoy The Marvels In The Trailer For ‘Now You See Me 2’!!!! This entry was posted on Tuesday, November 1st, 2016 at 12:55 pm	and is filed under Film, News. You can follow any responses to this entry through the RSS 2.0 feed. You can skip to the end and leave a response. Pinging is currently not allowed. « 4K UHD Review: ‘Jupiter Ascending’!